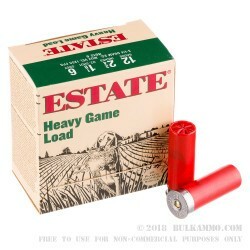 This 12 Gauge shotshell by Estate Cartridge is a great example of its manufacturer’s commitment to making quality shotgun fodder: Its reliable primer, clean burning propellant, evenly patterning wad, and sturdy plastic hull crimped just right are all indications that Estate is at the top of their game. You’ll find few companies that offer so much value for such an appealing price. 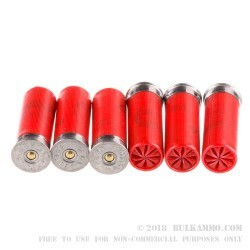 This shell is loaded with 1 ⅛ ounces of #6 shot. 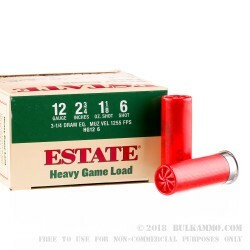 That shot size creates a nice 10 to 15 inch window of lethality at a distance of of about 35 yards, perfect for taking down even larger birds like turkey with a well-placed shot to the neck or noggin. Rabbit and squirrel are no match for it, either. 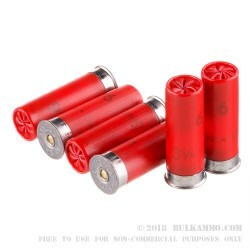 This middle-range birdshot is a blast for target shooting as well, so you’ll do well to invest in a box of 25 of these little red beauties.